After opening in 2009, Savy Paws became Cherokee County’s premier boarding and daycare facility. We empower all of our staff with the knowledge they need to create a fun, safe and stimulating environment for pets. Our facility was designed specifically to offer your pet(s) physical activity regardless of the weather. 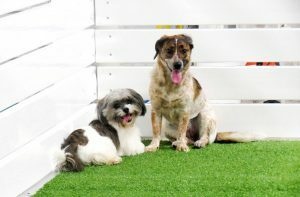 We offer indoor and outdoor play yards all equipped with artificial turf so that your pets can play all day and go home just as clean as when they came in! The staff at Savy Paws strives to cater to each pet’s individual needs whether they need medications, special diets or even one-on-one attention. We want your pet to have a blast and be as comfortable as possible while staying with us; therefore, we offer free playtime for all boarders and a free spa bath after a three night stay. Of course we want to cater to our clients as well, so there are no check-in or check-out times! We do ask though that your pets be dropped off at least 2 hours before closing so that we can ensure they are completely comfortable and have full bellies before bed! BEHAVIOR: All dogs must be non-aggressive. Owners will certify their dogs have not harmed or shown any aggressive or threatening behavior towards any person or any other dog(s). Please remember: your pet will be spending time with other pets and the safety and health of all animals is our main concern.